“Home Is Where The Hatred Is” picks right up where “Scorn” left off, but continuing the stark decline into tonal depravity. 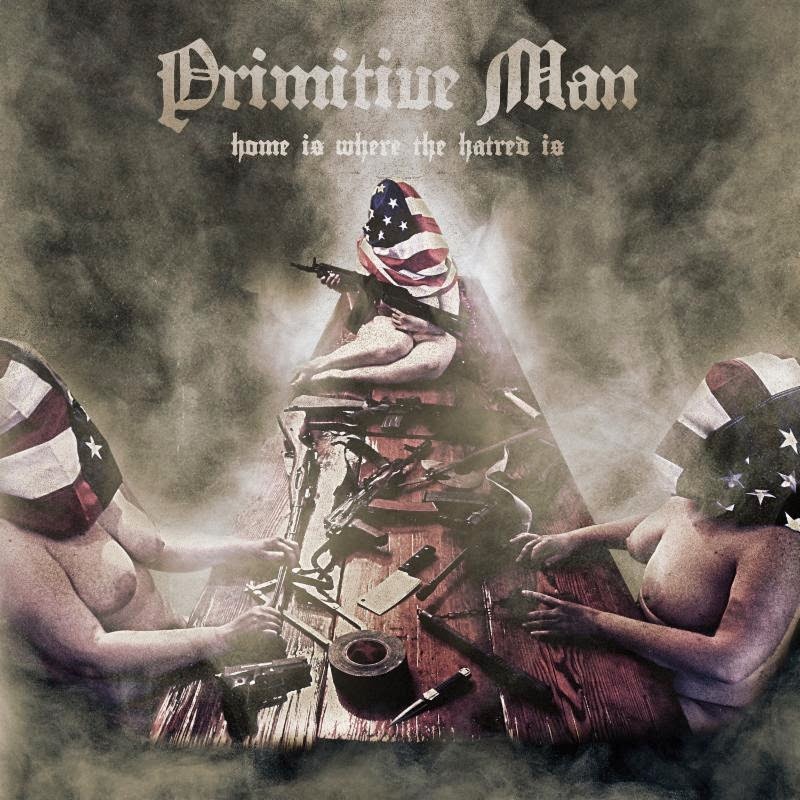 There is a soulless emptiness that rises throughout this release and love them or loathe them, Primitive Man completely captures this sound and does dirty, dirty things to it. This lesson in severe depressive anxiety begins with “Loathe” an 11 minute pummelling. Tension begins with seconds of feedback then the beatings begin! Bass and drums hammer out in unison with thunderous tones building and building, just waiting for it to break. As soon as the guitar breaks in, everything switches to a discordant drive with super clean heavy tom fills. Then just like that, everything drops out to a hate filled crawl with perfect guttural growls that coat everything Primitive Man has ever done. At about the 6 min mark, the mood swings continue with riffs that well up the feelings of all hope is lost and we are standing in the middle of the great undoing. 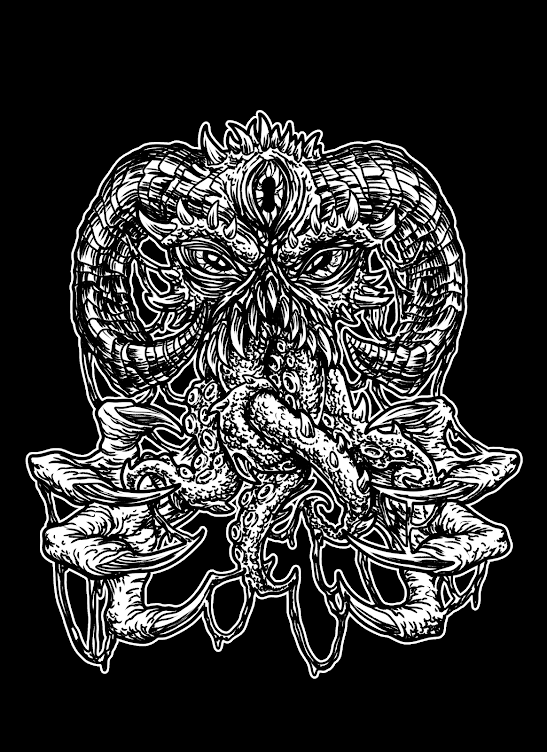 These riffs keep pulverizing you, dragging you down deeper and deeper into this madness. 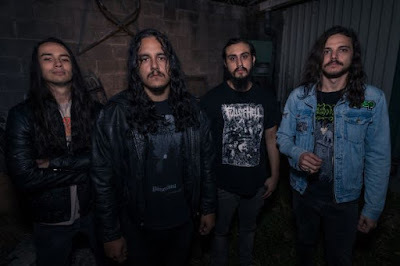 Already aurally exhausted, then “Downfall” kicks you in the gut with a faster paced crust punk feel with vocals that call out to the darkness within. There are blasts of blackened grind that rise up for a moment, only to be swallowed up by the oppressive sludge, the kind that resonates with all things negative, and the absolute worthlessness that resides within the heart of man. “Bag Man” staggers forth, unapologetically pinning the listener down beneath the weight of this behemoth. Straight forward in its approach, plodding along and making no excuses for the destruction in its wake. Off kilter riffs over a superb rhythm section tying together everything that madness and fever dreams are about. The tempo starts dragging at the end of the track, punishing and overwhelming. “A Marriage with Nothingness” finishes off this release leaving you feeling more uncomfortable than one thought possible going into it. It’s more in line with some of their noise tracks, but riddled with samples of either a woman’s moans of ecstasy, or of torture, or possibly both. Either way, it gives me the impression that I’m hearing something that I shouldn’t be hearing and leaves me feeling dirty and wanting to take a shower. This is such an amazing album, from start to finish. It is a harsh lesson in musical brutality and severe psychosis. The tone and quality achieved from each of the members is hard to beat these days, so in my opinion, this is truly a sick, sick release.